2016 marked the 130th anniversary of the Statue of Liberty. This short article is about two love stories of freedom, and of a centuries-old friendship between two peoples: the French and the Americans. Guarding the mouth of the Hudson River at the South of Manhattan, New York City, the Statue of Liberty, masterpiece of the Alsatian sculptor Frédéric Auguste Bartholdi, represents the idea of freedom and of the American dream. It is the French people, the defenders of freedom since its Révolution in 1789, who offered the Statue of “Liberty enlightening the world” to the American people, a name which is meant to remind the universal ideal of Liberty, popular in the 18th century. This century of Enlightenment came to an end with the freedom fights of the American and French people, who obtained their freedom 13 years apart, in 1776 and 1789, respectively. The inauguration of the Statue of Liberty on the 28th of October 1886, celebrates the friendship of these two peoples and their common vision of freedom, characterised by a desire to spread it all around the world. “I will fight for Liberty; I will appeal to the free people. I will try to glorify the Republic there, while waiting to find it again in France”. Born in Colmar, Alsace, the 2nd of August 1834 and deceased in Paris the 4th of October 1904, Frédéric Auguste Bartholdi was a committed sculptor, who dedicated his skills to serve the ideal of a strong and free people. He imagined the Bartholdi fountain, inaugurated in Lyon in 1892, on Terreaux Square, and he sculpted the Lion of Belfort in a cliff in 1889 to commemorate the heroic resistance of the General Denfert-Rochereau in Belfort from 1870 to 1871. He studied architecture at the National School of Fine Arts in Paris and he learnt painting from Ary Scheffer, on Rue Chaptal, in the same city. But it is in Colmar that he signed his first piece as a sculptor and architect, in 1856: a monument dedicated to the memory of General Jean Rapp from Colmar, who became a hero after distinguishing himself in battle under Napoléon, Emperor of the French people. After he sculpted a first 11.5 meters high plaster model of the statue “Liberty enlightening the world” in 1870, which can be admired in the “Musée des Beaux-Arts”, the Alsatian sculptor crossed the Atlantic Ocean to inspect Bedloe Island, which would become Liberty Island with the construction of the statue. During his stay, he tried to rally supporters and presented his project to the President of the United States, Ulysses S. Grant. He entrusted the American people with the construction of the base upon which the French would assemble their gift. First planned for 1876, the inauguration of the Statue of Liberty eventually took place in 1886 delayed because of financial problems. Thousands of individuals, and several cities and public organisations donated more than 400,000 francs (a huge sum at this time) before the end of 1875, in order to finance the gift intended for the American people. However, the necessary one million francs was only reached in 1880. In the United States, the first pages of the New York World, several shows, exhibitions, auction sales and professional boxing games enabled the financial difficulties encountered during the construction of the base to be overcome. To finish, the statue itself participated helped finance itself: its plaster hand, broken in 1876 and displayed, and its head, displayed at the 1878 World Exhibition, helped to gather the necessary funds with the entrance fees of the exhibitions. “Liberty enlightening the world” was represented by a woman standing, turned towards France, wearing a loose-fitting dress and crowned with a diadem which is like Helios’, the god of sun, whose points symbolised the 7 continents (or the seven oceans). JULY IV MDCCLXXVI (July 4 1776). The torch that the statue points to the sky reminds us of the ideas of the Enlightenment Age. At the foot of the base, freedom is symbolised by broken chains. There is a significant debate concerning Bartholdi’s sources of inspiration for the creation of the Statue of Liberty. Although the sculptor always maintained that it is truly an original piece, some think that he used the main characteristics of one of his former projects, designed for the Suez channel but never implemented: a lighthouse representing the goddess Libertas (from the Roman pantheon), dressed as an Egyptian peasant, whose light would come from a frontal headband and a torch pointed at the sky. It is also possible to see the Statue of Liberty as the heiress of the Colossus of Rhodes, one of the Seven Wonders of the Ancient World. The strict expression on the statue’s face makes it look like Bartholdi’s mother, Charlotte, who he was very close to. The sculptor never rejected this idea, but it is also possible that he simply created a more neutral synthesis of the feminine face. Gustave Eiffel designed the steel structure which supports the leaves of lead, and gold in the torch casing, that Bartholdi shaped from the inside. In 1884, famous individuals such as the French President Jules Grévy and the writer Victor Hugo admired the statue at 25 Rue de Chazelles in Paris (17th arrondissement, near Parc Monceau), just after its last parts were completed. In 1885, the statue was dismantled in 350 pieces and dispatched in 214 boxes. This shipment did not include the right arm and its flame, which were already in America. The French frigate, “L’Isère”, shipped these boxes along with a further 36 which were filled with the material that was necessary to assemble the statue. Destination: Bedloe Island. Urban legend has it that the statue’s pedestal was made of the resilient stone of Kersanton, imported from Brittany, and its facing of Euville stone. Famous for its white color and its low level of seawater erosion, the stone of the small French village’s quarries, Euville, in Lorraine, was also used to build the Gothic cathedral of Toul and the neo-classical Stanislas Square in Nancy. However this is untrue as the pedestal is made up of concrete covered with a granite-block face. Two series of beams inserted in the pedestal were used to link the base of the steel skeleton to the statue. The mortar of the base’s last stone contains silver coins, dropped there by the masons, and a bronze casket itself containing the business cards, medals and newspapers of the persons who were present at the closing ceremony of the construction site. Four months after the beginning of the assembly, the 92 meters high monument – from the foot of the base to the tip of the torch – enlightened the world. The American President Grover Cleveland, his 600 guests and thousands of spectators were at its inauguration. It has been visited by the numerous immigrants who used to transit through Ellis Island, and several million people who visit the statue each year. The Statue of Liberty did literally enlighten in the beginning since, from 1886 to 1902, it was used as a lighthouse, directing its light up to 39 kilometers far off the coast. Regarding the figurative enlightenment, the statue is one of the National Historic Landmarks of the United States since 1924, and it joined the list of the UNESCO world heritage in 1984. Several replicas found in France also reflect the prestige of the Statue of Liberty. The most famous replica was offered to the French people by the French living in the United States, 100 years after the French Revolution of 1789. Located in Paris nearby Bartholdi’s old workshop, on “‘île aux Cygnes” (Swans Island), next to the Grenelle bridge, it was first orientated so that it would face the French presidential palace, “l’Élysée”. However, it was later turned toward its American big sister. 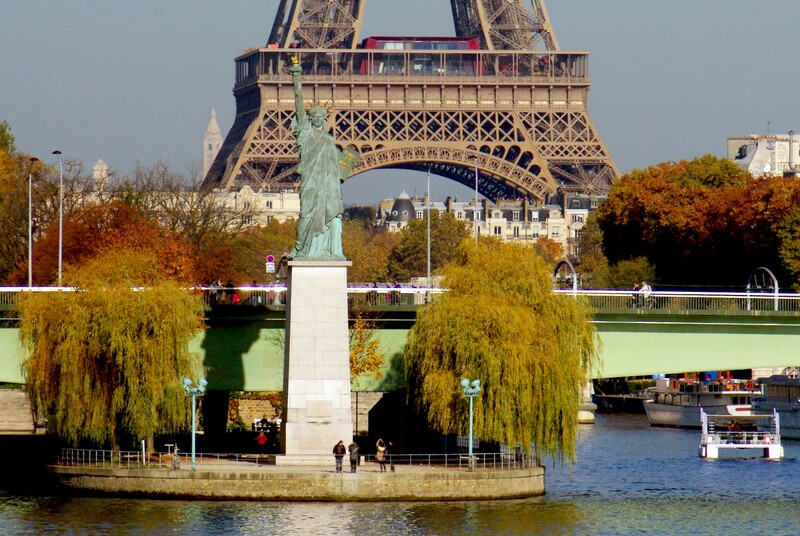 Find out more about the Statue of Liberty on the Île aux Cygnes. 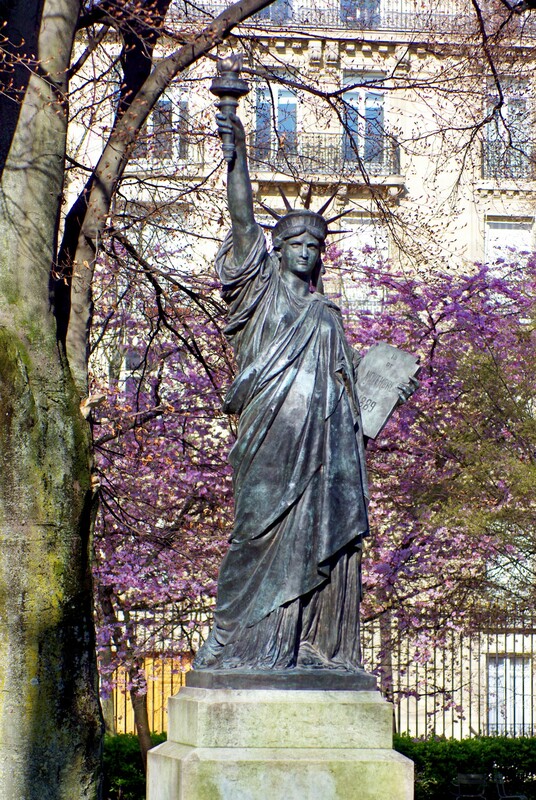 Bartholdi had also made a bronze replica that was used as a model for the construction of the American statue. He offered it to the Musée du Luxembourg in 1900. Since 1906, it has been displayed in the Luxembourg garden. 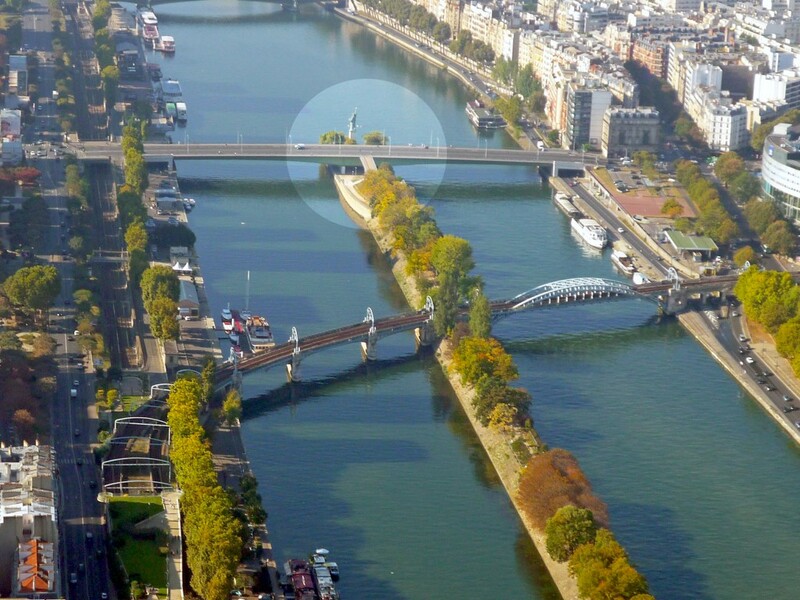 On its tablet, as an unexpected mise en abyme, one can read the inauguration date of the Grenelle bridge statue: “15 de novembre 1889”. Taller, but made in a less noble material, the 13.50 meters high polyester copy that was used in the 1969 movie of Gérard Oury, Le Cerveau (The Brain), was saved from destruction by the concerted action of Paul Belmondo (sculptor and father of the actor Jean-Paul Belmondo), of the mayor of Barentin and of Gérard Oury. It is displayed in the little town of Barentin, in Upper Normandy. Last and definitely not least, the replica that you can admire in Colmar is 12 metres high and was placed at the northern entrance of the town in 2004, on the 100th anniversary of Bartholdi’s death. It is the tallest authentic copy of “Liberty enlightening the world” (Barentin’s copy does not meet the authenticity conditions). A full-scale replica of the torch of the statue stands in Place d’Alma in Paris. The Flame of Liberty has become an unofficial shrine to Lady Diana as her car crashed in the tunnel just under the square on 31 August 1997. In Bartholdi’s hometown it is also possible to visit the Bartholdi Museum (Musée Bartholdi). The residence of the sculptor was left to the city of Colmar by his widow, who died in 1914. It is this vast mansion of Marchands street (rue des Marchands) that was inaugurated, in 1922, a museum dedicated to the life and the work of the artist. It displays preliminary sketches, scale models, sculptures, drawings, photographs, paintings, engravings and art objects. Most of these come from his workshop of Paris, on Rue Assas. The Bartholdi Museum’s goal is to preserve and pass on the memory of the man who fulfilled an extraordinary mission on behalf of the French people: to offer the Statue of Liberty to the American people. Visit the website of the Bartholdi Museum in Colmar. Did you enjoy reading our post? If so share it on Facebook, Twitter or Pinterest! Check-out the US immigration page resource for additional information about the Statue of Liberty.